I bought this quilt set for my daughter and she loves it. I ended up buy another one as my youngest daughter loved it too. It has held up well, had it for almost a year. Encourage your child's love of animals with the Bricky woodland coverlet set from Taylor & Olive. Featuring gender-neutral hues and a modern animal print, this charming coverlet indulges both your child's imagination and your sense of style. Although this item is created for children, I ordered it for a full bed in my guest room which will most certainly be used by adults. The colors are just muted enough and the animals are the cutest. My favorite is the embroidered hedgehog pillow that was included. Woodland animals are loved by all. You just have to be brave enough to go with what you love, no matter what your age. The coverlet set is cute but the colors are so subdued, the animals don't really pop at you like in the photo. It is charming, but busies up the room a little too much, and adds a drab factor (the subdued colors). I might return these. Love, love, love this coverlet & shams. It is very well made & the full/queen is wide enough that on a full size bed, it falls long enough on each side that a bed ruffle is not needed. I also ordered a shower curtain (it's also 100% cotton) & had a Roman shade made for my single window. It makes a beautiful bedroom for my grand daughter. I bought this to transition from my kid's winter wool comforter into spring and summer. The fabric is a high-quality child-friendly cotton. The print is really sweet and interesting (the animals go beyond what is typically represented in children's prints) and should transition well from my 5 year-old to a young teen. It has an intentional slightly faded look. The stitching is high-quality and the quilt held up fine to the initial washing in the machine. The little hedgehog pillow is a nice addition. 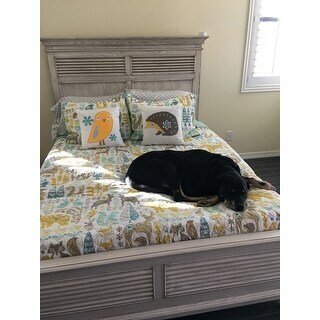 I wish the bird pillow was also available for sale! Very cute coverlet for my kids' room. I love INK+IVY products and this set didn't disappoint. The quality is apparent and the price was great. The colors are soft and muted - perfect for a child who isn't looking for a strong 'themed' look for their bedroom. This set is so cute and high quality. I have been pleased with the purchase. Very soft, smooth and the colors are exactly as pictured. Washes well too. My kids love these. Couldn’t be happier with this purchase. Great for little boys room! Perfect! This blends well with my lemon colored walls and sage/teal trim throughout the house. Unfortunately the dog doesn’t blend in as well. "Coverlet. A coverlet is a lightweight, non-reversible bedspread that is usually either quilted or woven. Was this product a quilted or woven?" We are grandparents with a cabin in the woods, our grandchildren will love this quilt. "Are the pics on wall available?" Unfortunately, we do not carry the the pictures.